Thirteen months from today will be my 25th wedding anniversary. Notice I did not say “our” anniversary. While Joe and I are no longer married, it is still the anniversary of when I legally joined the Kearns family – and that deserves to be celebrated. It will be a quiet celebration between me, God, Jesus and the Holy Spirit. I do not expect a shindig. When the 25th anniversary arrives, the 10th anniversary of Joe’s passing will have come and gone (3/29). A decade without him and what accomplishments do I have to show for the past 10 years? Not much. There is this blog, my photography blog and taking care of Rommie until her passing. But there have been more failures than successes. These failures, mostly career related, have left a lot of bumps and bruises on my heart, mind and soul. However, my current life is in shambles. Most of the 8 areas of life stink. – career does not stink as I started a wonderful job, working for a wonderful company. I just came up with the idea for this journey 24 hours ago, so there is no grand plan for the following areas – yet. Growing career helping people solve problems and/or rebuild their life. Getting as physically fit as a superhero. Get mentally fit (this means faith). The rest of my mental self is well. Get back to photography (my shutter quit after 9 years). Romance/Significant Other Got to get the other areas straightened out before I start work on this area. The good news is you can always begin again, right where you are at, with what you have, on any given day, in any area of life. God’s mercies are new every morning. So I have 13 months to finally get my act together and turn this life around so it honors and glorifies God, and honors Joe’s memory. Come with me on this journey. I will post on the 19th of every month, unless that is a Sunday as I do not want to interrupt the 52 Bible Verses For A Joy Filled Year series. Just Trying To Be Nice? People ask that question but really do not want to know the answer. All they want to hear is “fine.” They usually are asking the question just to be nice. How is your physical health? Physical health is one of the 8 key areas of life according to J.T. O’Donnell. I put them in the order of importance for me as of today. The bottom six fluctuate but Mental and Physical self are always the top two. Darren Rowse spoke about his physical self in episode #38 of his ProBlogger Podcast. He talks about changes he made and how they impacted his life and blog. What he has to say applies to everyone and not to just us bloggers. I’ve made a change as a result (there are times my laptop sits on an empty milk crate, so I have to stand). The condition of your physical self becomes more important after losing a spouse. You need to see your doctor as soon as possible so you have a starting point from which to improve or maintain depending upon your results. When making your appointment inform them your spouse passed away, odds are they will get you in quickly. Aside from reading your Bible and doing a daily devotion, the best use of your time today is to listen to Episode 38 of Problogger Podcast. Two years ago I joined Faithful Finish Lines fitness program when it was in Beta. I am still a member. This week is the last week in the most recent 7-week challenge. Seven weeks filled with making small changes on a different topic (e.g. more protein, less sugar) each week. The less sugar week is tough as I have a big sweet tooth. At the end of each 7-week period we have a goal to do. It could be a 5k, 10k, a plank or push up challenge, or any other fitness goal. It does not have to be an organized event. 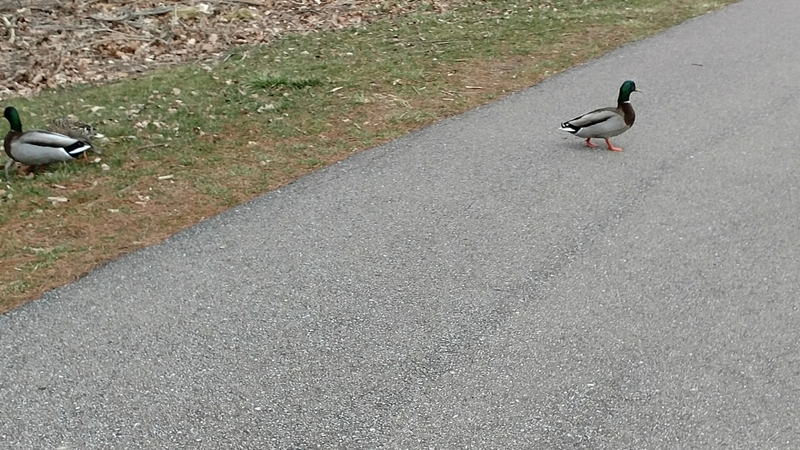 Instead I did the 1 mile Duck, Duck, Goose Waddle at one of the area parks. 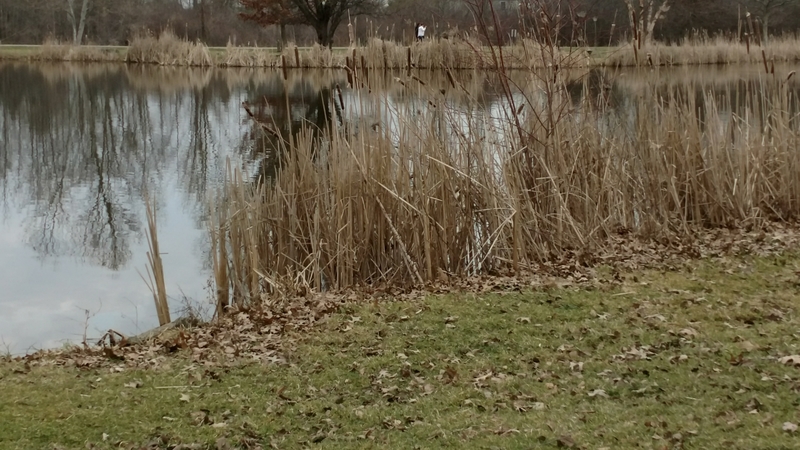 The waddling started when I got out of my car, then I did 2 laps around the pond and ended when I returned to my car huffing and puffing worse than the Big Bad Wolf. When the weather permits I get out and walk because asthma needs to go bye-bye. When the weather interferes, you can find me doing a lap around the mall or several laps up and down my basement steps. As I sit here typing this post, I can tell you I feel marvelous! I have to keep this up as the 2017 Tour de Parks is coming up (walking one Northeast Ohio park every weekend). More on that later. 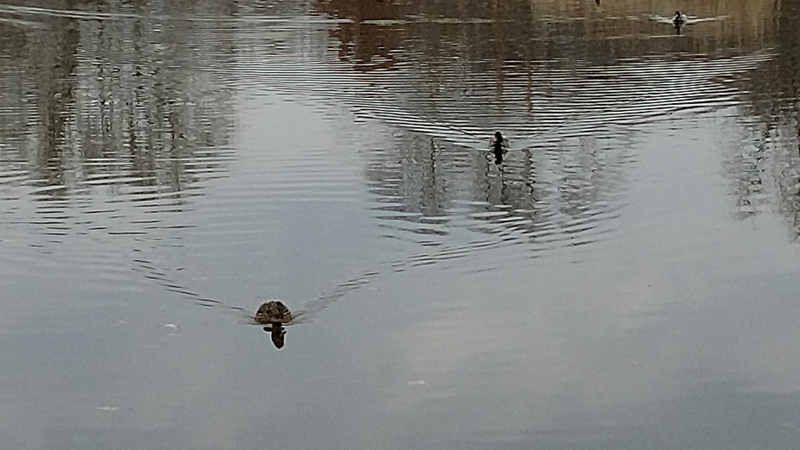 Here are pictures from the 1 mile Duck, Duck, Goose Waddle event. All photo’s taken with my Moto Z phone – Yes, still an Apple virgin. 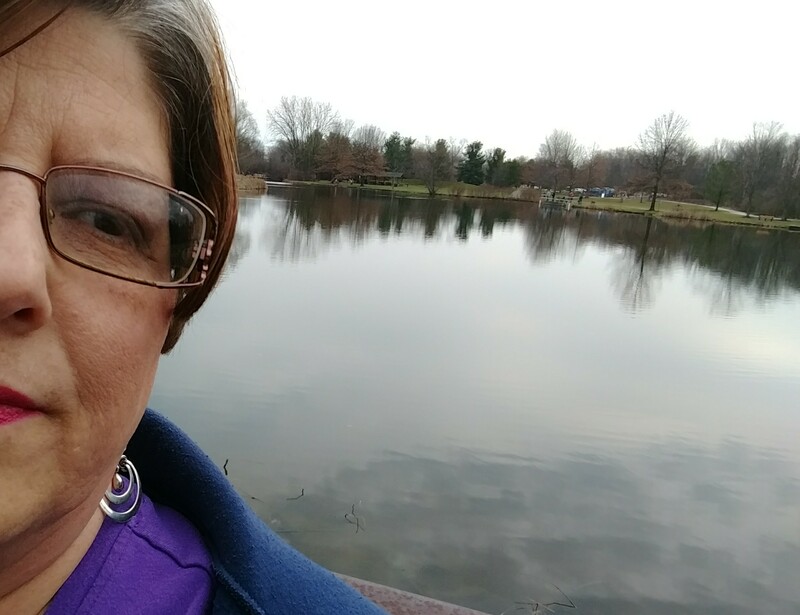 Selfie-on the bridge at the back of the pond. Cattails and last years leaves. Look who decided to walk with me after passing the 3/4 mile mark. 2,003 steps. 287 Calories. 42.28 minutes. 1 mile walked. 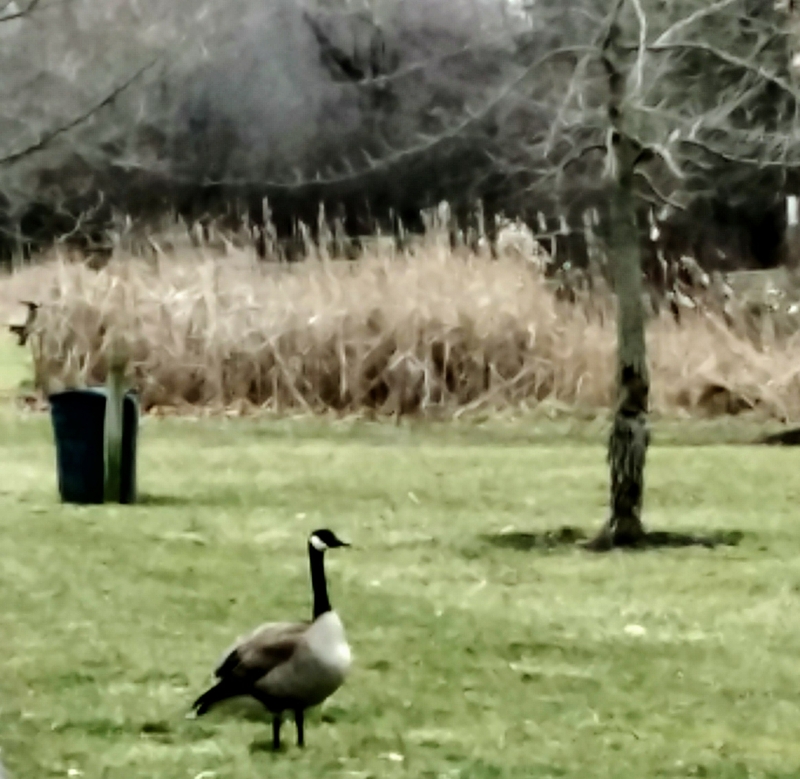 2 laps around North Park pond, picnic area and parking lot. Check out the Faithful Finish Lines program. Sara Borgstede from the Holy Mess is the founder. You will not find a better community of friendly, supportive women.